This week I'm obsessed with... Sephora Mini Brush Cleaners! Sephora Mini Solid Brush Cleaner - 17g - $10 - a gentle, solid sponge and brush cleanser that removes even the most stubborn makeup, dirt and germs. Formulated with soothing argan oil to condition gently as it rapidly breaks down excess residue and germs. It is lightly scented, free of dyes and other skin irritants, and can be used daily without harming brushes. 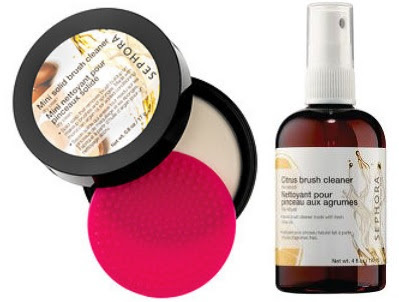 Sephora Mini Citrus Brush Cleaner - 59ml - $8 - a professional-grade liquid brush cleanser that gently reconditions both natural and synthetic-haired brushes, returning their sheen and luster. It is formulated to remove the toughest adhesives and formulas - glue, mascara, latex and even acrylic - from the most delicate natural and synthetic fibers - with a great, light citrus scent.